Posted by Bill Mann on Wednesday, February 27th, 2013 at 7:04am. Moving everything in your house to your new Rehoboth Beach home can be an overwhelming task. You never realize how much stuff you actually own until you try to fit it all into boxes and move it somewhere new. You don't have to wait until the day before you move to start packing everything in your house! 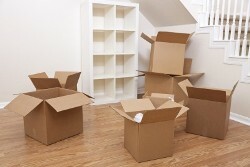 As soon as you find out that you are moving, you can start packing the items you don’t often use, such as your seasonal decorations, photo albums and family keepsakes. If you pack a few items per week, you’ll have almost everything packed by the time you are ready to go except for the essentials you use every day. Rather than randomly throwing every item you see into a box, think ahead and create a logical plan for your packing. Before you start, develop a simple record-keeping system. Give every box you pack a number and write a corresponding list detailing the items in that box. This way, when you arrive you will know exactly where to find each item. You will want to keep all of the items from each area of the house together so they can be unpacked easily. For example, keep all of the boxes of kitchen supplies together and then put them straight into the kitchen when you arrive at your new home. You could even designate a color for each room in the house and put colored stickers on the boxes so that the movers or anyone helping you can easily determine in which room a box belongs. One final consideration that can make your move easier is to use your move as an opportunity to pare down your unused belongings. Plus, you won't be left wondering why you decided to move things from one home to another once you start unpacking. As with many things, the more organized you are when packing, the less stressful it will be when you arrive at your new home in Rehoboth Beach.